The refreshing Paloma: tequila, lime, grapefruit soda. Photo by Donna Turner Ruhlman. This has become my favorite of Donna’s cocktail shots because it so accurately reflects the experience of drinking it. And as she’s on the road, playing hooky from her camera, I’m reposting this perfect summer cocktail. It’s dry and hot here in Clevelandtown, and these are seriously refreshing. Tequila, lime juice, and grapefruit soda. Couldn’t be simpler. I love Tequila Ocho Reposado. 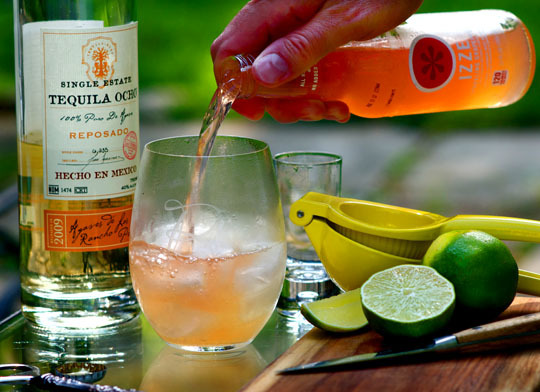 Normally I save the good stuff for straight-up drinking, but it’s worth using in the Paloma because the lime and grapefruit flavors intermingle with and elevate, rather than obscure, the flavor of the tequila. And I make it strong, so I can taste it, goddammit. Izze is excellent soda (not too sweet, lots of carbonation) and it’s what my grocery store carries. Jarritos is the brand most often recommended. But half grapefruit juice and half soda water works as well. Have a most excellent weekend, all! Combine all of the ingredients in a beautiful glass filled with ice. If it’s very hot where you are, pause to consider you are about to indulge yourself with one of the most refreshing cocktails you’ve ever had. Be a member of the Tequila Interchange Project. Rick Bayless’s Frontera Grill in Chicago has some pretty stellar margaritas; here are some of his cocktail recipes. © 2013 Michael Ruhlman. Photo © 2013 Donna Turner Ruhlman. All rights reserved. Where do you find that tequila in Cleveland? It’s one I haven’t seen at my local liquor stores. Pellegrino makes a nice grapefruit soda too. I am not really a fan of tequila, or is it vice versa? The Pelligrino graprefruit soda is sublime. I use the Pellegrino grapefruit in mine with wonderful results. Since you first posted this, it has been one of my summertime favorites. I really like adding an ounce of aperol to it. The extra bittersweet citrus adds a touch of complexity and the color is even more vibrant. I concur with everyone recommending San Pellegrino Pompelmo. I don’t like grapefruit otherwise, but in a Paloma it’s extraordinary. Perfect cocktail for hot, muggy weather. I use Cazadores Reposado, a tequila I like enough to drink neat. Don’t skimp on the booze. Better is, well, better. You’ll have to call it a Texas Pamplona or such. sounds interesting! being served on the beach now-long day of swimming-finished off by the cooling cocktail. As luck would have a few bottles of Casa Dragons were delivered today! Better replace with Patron or Ocho as the night goes on. Lisa hand juiced the Grapefruit and Faygo Lemon/lime. The beach fire steel griddle is getting ready for mussels, clams and oysters then the finally, shaved beef, pork, and shrimp marinated in lime,adobo, onions, and anything else I found with, all the trimmings. – Via el summer in Traverse City! sounds like you know how to enjoy yourself! We started making this regularly in the hot weather after you posted it last year. As miserable as last weekend was in upstate NY, this weekend is glorious. Warm, summerly, but not so humid, windows open, scent of just cut grass drifting in. I think we’ll drink this tonight at sunset. I’ll have to try Izze and the San Pellegrino Pompelmo! Of the Mexican grapefruit (“Toronja”), Jarritos is definitely the best; most of the others are WAY too sweet and lack that Grapefruit bitterness. Jarritos has a little bit, and for whatever reason, works very well with Tequila. Wonderful cocktail. Squirt and tequilla is pretty close and will work if limes aren’t available. oh yeah. i love Squirt & tequila. I love the Izze sodas but would like to put in a plug for Jarritos Grapfruit and other flavored sodas. These are made in Mexico and often used in AZ and NM to make Palomas. They are available in Mexican market stores and are beyond refreshing for mixing with spirits of all kinds. As much as I like the tequila version, I’ve absolutely fallen in love with Palomas made with mezcal instead. I find the smokiness of a decent mezcal gives the drink more depth than does tequila. Give it a try. Was about to post how good this drink is with mezcal, and now see im not the first. I concur. Awesome with mezcal. I make a Jamaican “Rum Ting” – it uses Ting, a Jamaican grapefruit soda, (sold in Publix, small $1 bottles, perfect size for one drink) with dark rum and a squeeze of a wedge of lime -veeeery refreshing down here in always hot FL….now I can try the Izzie soda with rum, and you can try the tequila with Ting!